It looked as though Senna had his matchup sorted from the beginning, but Alguersuari brought it level towards the end of the day. I wonder if this next pairing will be a close one or not? 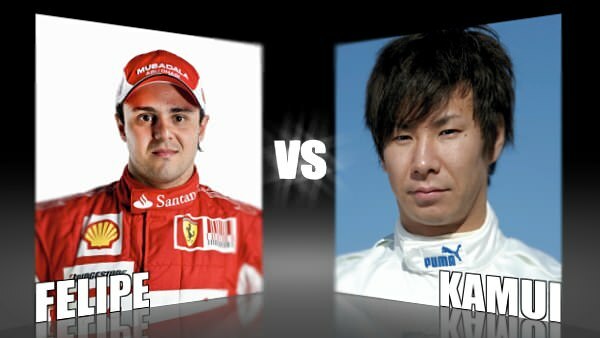 We're putting the Brazilian Ferrari driver of Felipe Massa against the quiet Japanese Kamui Kobayashi. Who will get your vote? Massa was known for his rash and somewhat reckless driving initially, but when teamed with the excellent Rob Smedley and facing off against Lewis Hamilton for the championship, he turned things around. No longer was he a youngster trying to make an impression in the paddock, he'd already made it. That was then, though, and these days, he's a little more subdued. The Ferrari underperforms, and his crash last year saw him sit out a lot of the session. How has his character coped with all these changes? Kobayashi is another of those drivers who keeps pretty quiet and has a relatively low profile around the paddock, but if you know where to look, pieces of his character do shine out. For a start, he's not afraid to take a driver on out on track - when he gets the opportunity. Some have raised eyebrows at his antics, but they do at least spice up a weekend. He and teammate Pedro de la Rosa also spent some time recently cooking up a storm as a PR event.